As globally operating bonding engineers, Lohmann has demonstrated for many years and in numerous sectors that it only delivers the highest quality. Our name is synonymous with decades of expertise in adhesive bonds, innovative developments, the most up-to-date production processes and uncompromising customer focus. The Lohmann group employs over 1800 staff across the world, all of whom work in line with well-defined values. Values that make us a promising and reliable partner. For you as well. 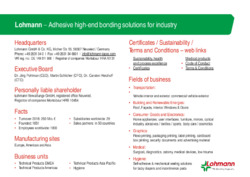 Lohmann is a leading global adhesives manufacturer. Read how more than 160 years have made us what we are today. Read here why Lohmann is the right partner for you. After all, we act in accordance with values against which we measure ourselves. The Technology Center at the Neuwied site offers over 1,200 m² of space for new ideas and is at the same time one of the most modern coating plants world-wide. Lohmann is constantly in search of innovations and progress But in doing so, we are well aware of our responsibilities towards nature and the environment. With Lohmann you receive certified quality. Among others, the production of our adhesive tapes, our environmental management system and the clean-room manufacture are certified. We have subsidiaries all over the world so we are always close at hand. Our international office addresses can be found here.